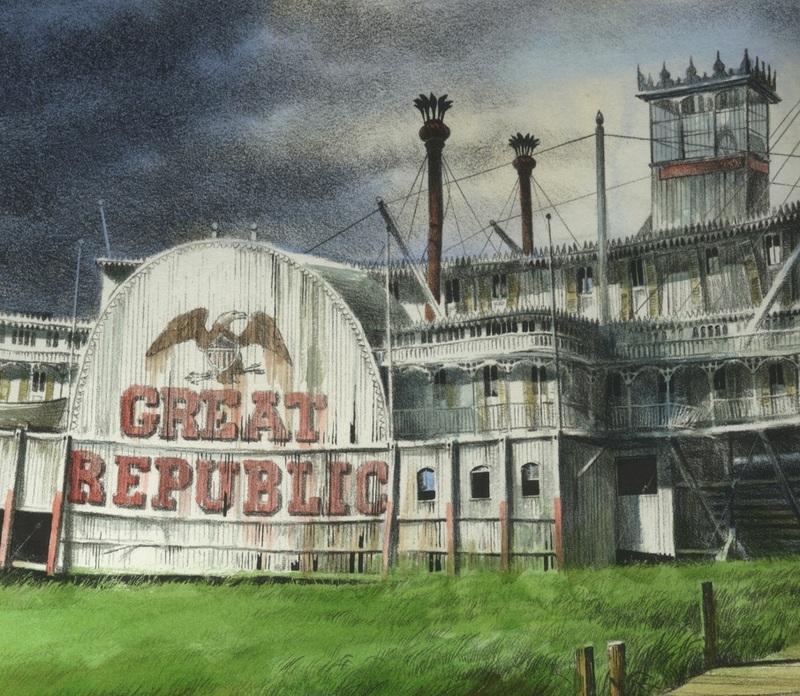 The architecture of the commercial buildings on the waterfront are typical of river cities and rivertowns like Hannibal, Missouri as it appeared when Sam Clemens was a boy there before the Civil War. Louisville, Kentucky on the Ohio River in 1868 at 2nd Street and the mouth of Beargrass Creek. The arriving Cincinnati and Louisville packet WILD WAGONER edges towards the Peoples Line wharf boat in mid-morning as people along Water Street go about their daily business. New acquisition: framed John Stobart print. 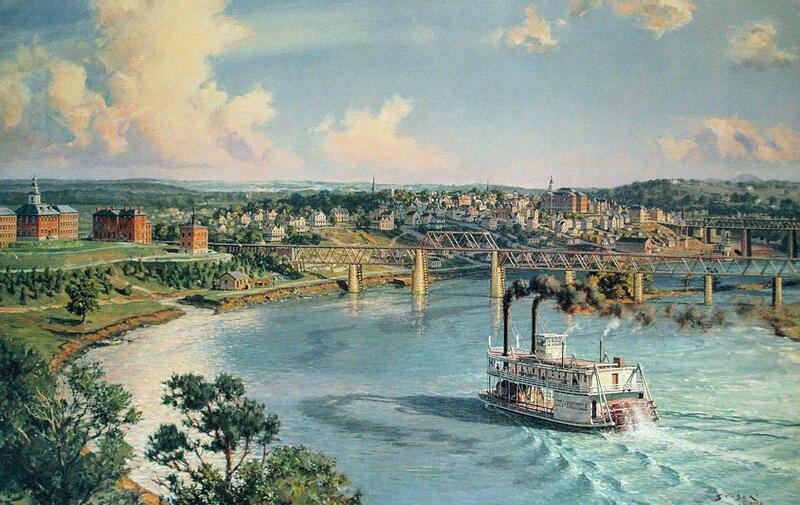 John Stobart's 2002 painting of KNOXVILLE, TENNESSEE entitled "The 'City of Knoxville' arriving from Chattanooga in 1891." The image area seen here is 18 x 28 1/2 inches. Fred Way's Packet Directory lists 3 sternwheel steamboats who were named City of Knoxville, but no steamboat named City of Knoxville operating in 1891. Perhaps there was a 4th boat by that name that did operate in 1891 that is not listed in Way's Directory. 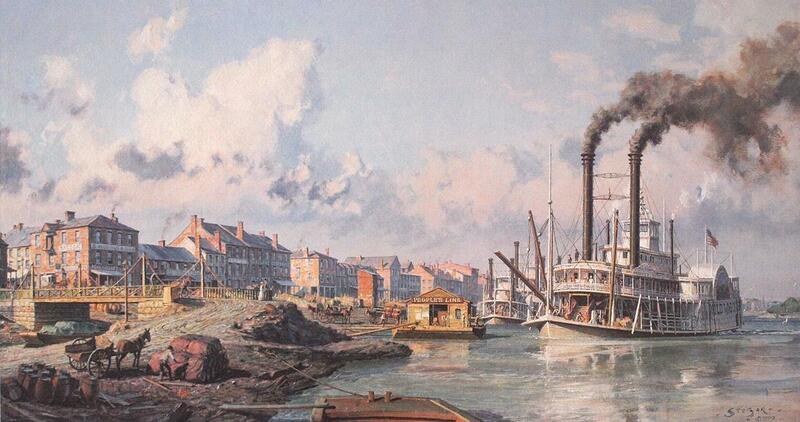 John Stobart painted this in 1978. This is a detail and an appealing composition, that is the deck of a sailing ship in lower left corner . . . Original limited edition prints of this are expensive but can be found on eBay if you've got a windfall and want to invest in a deluxe Stobart. This ROB'T E. LEE was the second boat bearing that name; she was nicknamed "Hoppin' Bob." 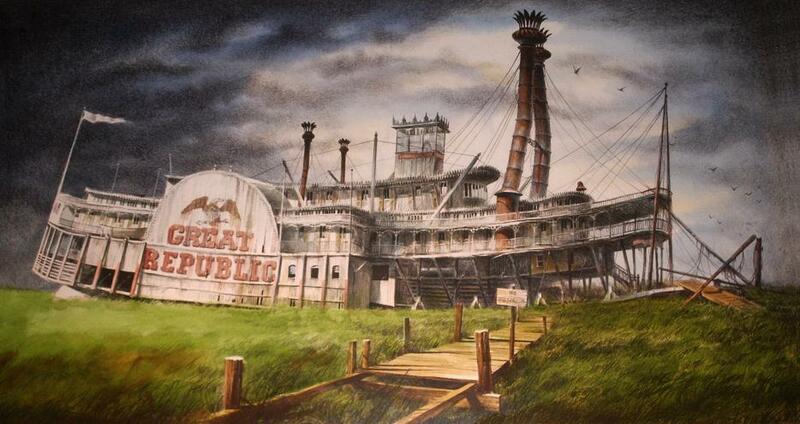 Launched April 1876, at Jeffersonville, Indiana where she was built at the Howard boat yard. Lost in a fire at Yucatan Plantation, Louisiana in September of 1882. 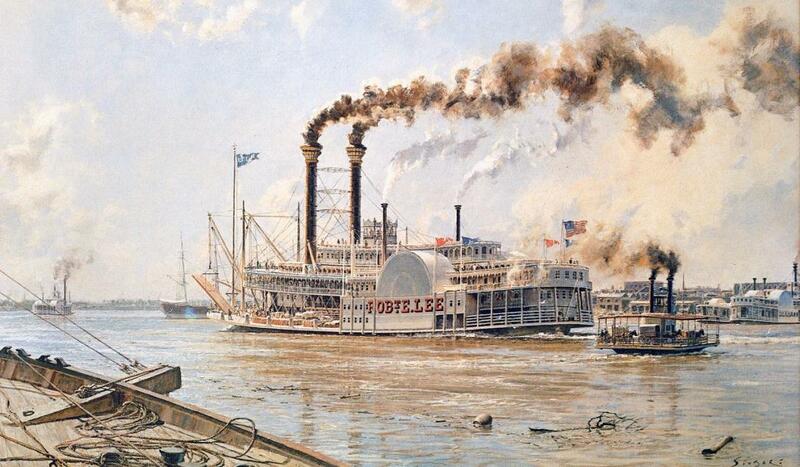 The first ROB'T E. LEE beat the NATCHEZ in a race from New Orleans to St. Louis in 1870. 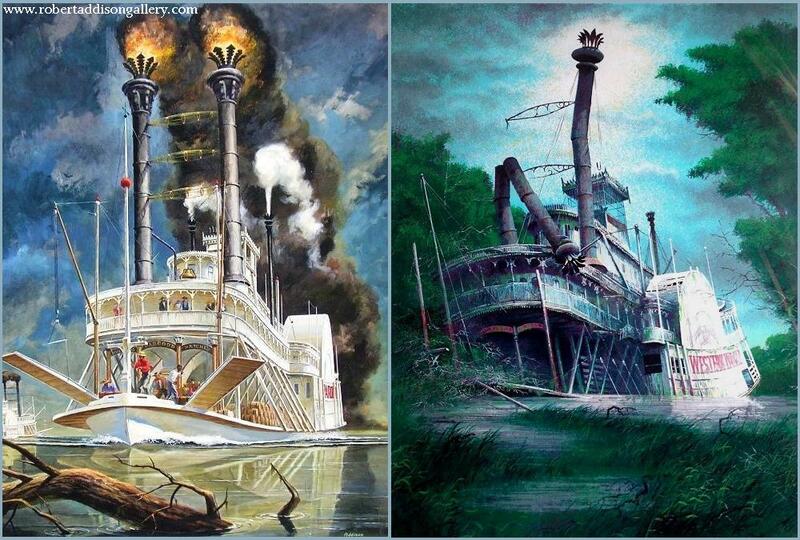 On the left is Robert Addison's (1924-1988) painting/illustration of a steamboat named PARGOUD. There was a steamboat called the FRANK PARGOUD (1868-1887) which was a sidewheeler as is the boat in the painting so it is likely that is the boat Addison intended it to be. 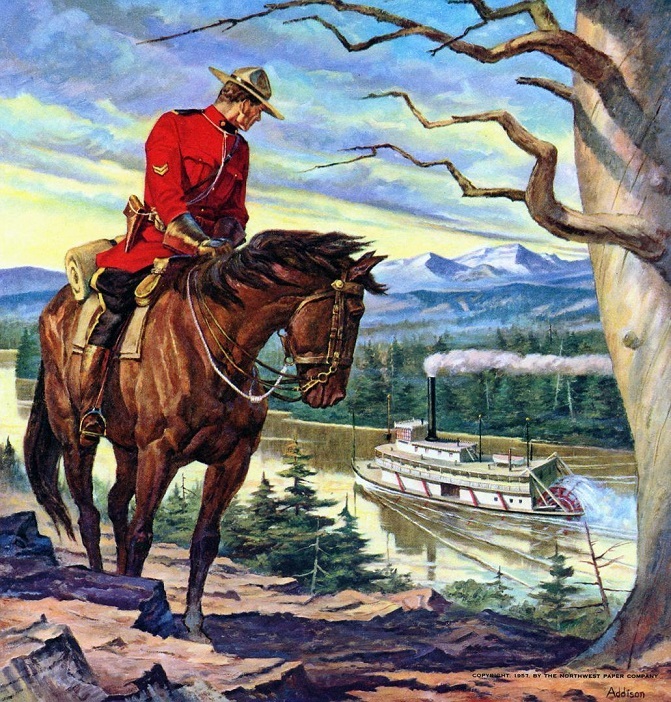 A later boat named simply "PARGOUD" (1884-1898) was a sternwheeler. Serigraph signed by the artist Robert Addison with color that he added by hand. (The black and white version can be seen in the previous file on this page). This is serigraph Number One of one hundred that were hand painted by the artist.